Notice is hereby given that a panel of citizens has been established to submit a recommendation to the Court regarding the matter of the reappointment of Sheri Pym to an additional eight (8) year term. Magistrate Judge Sheri Pym’s term expires April 17, 2019. The duties of the Magistrate Judge position are wide-ranging. 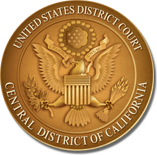 These duties are set forth in Central District General Orders 05-07 and 06-01, available on the Court’s website at: www.cacd.uscourts.gov. Basic jurisdiction of United States Magistrate Judges is specified in 28 U.S.C. § 636.